Hello, ReFabulous! 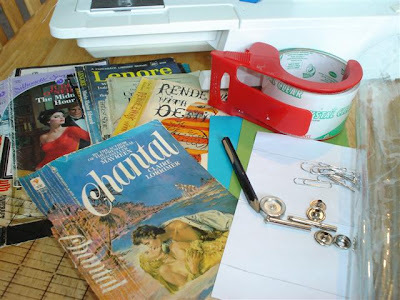 : Make your own paperback wallet! 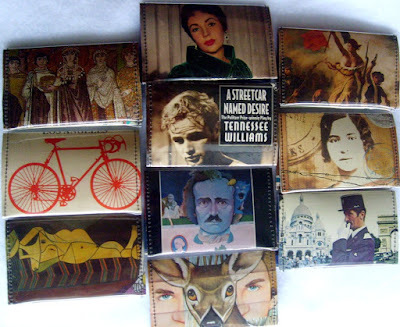 Make your own paperback wallet! This basic wallet was not my idea... the original link does not work (but here it is anyway.) The original design was flawed, and the wallets ripped the first time you opened them. I changed the design, and made them much, much stronger. My own wallet is over 1 1/2 years in use now, and still going strong. Not bad, huh? I don't mind if anyone sells wallets made from this design, just please don't sell my tutorial. If you have any questions, you can post them in the comments below, and I'll try to answer any you may have. 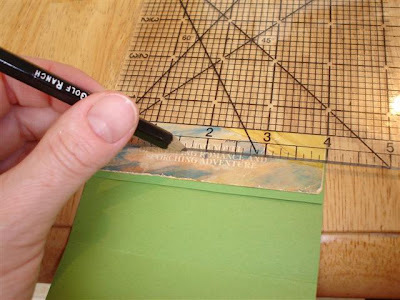 **Cut a template measuring 4" X 7" from scrap paper. **Fold template in half across the middle. You will now have 3.5" on each side. **Fold ends of template in 1" on each end... these will be the pockets. When those ends are folded in, the wallet should measure 2.5". See pic above for help.... I know I don't explain that part very well. **Using your template, cut out your cardstock interior piece. **Fold cardstock interior the same way you folded the template. Set aside. 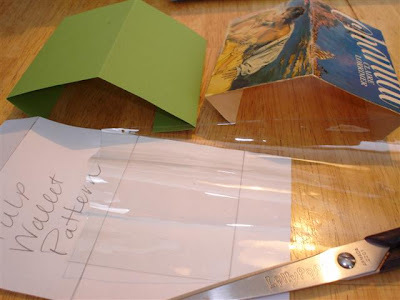 **Now, cut a piece of vinyl slightly larger than the template. Set aside. 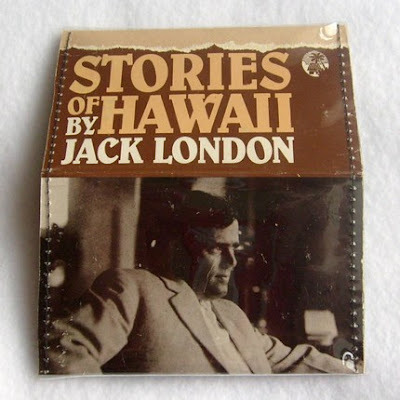 **In this picture, the center crease would have been right across Jack London's face, ruining the design. I needed to shift the design down a bit, but the cover would then be about 1.5 inches too short. You'll need to basically extend the cover a bit with some extra cardstock! **I just took a piece of scrap cardstock about 2" long, and 4" wide. 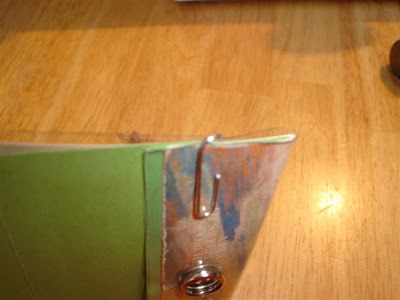 Place that scrap piece on the back of the book cover on the too-short end. 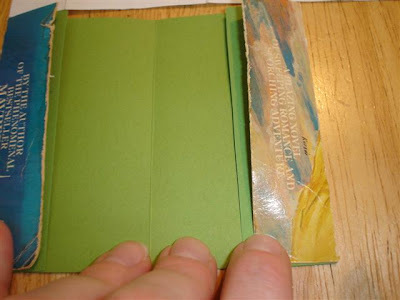 Glue the scrap piece to the bookcover, and then reinforce that part with a small bit of packing tape. (Elmer's purple glue stick works great!) Let it dry a few minutes. **Now, you can cut out your cover using the template. **Fold cover just like the template. **Make some folding adjustments to the interior if you need to to get them to fit. It's OK (and normal) if the interior doesn't fit exactly inside the cover. Don't worry -- that will be trimmed later. **Place the vinyl on the cover and interior. Place paperclips on each end, on both sides. Don't use pins. 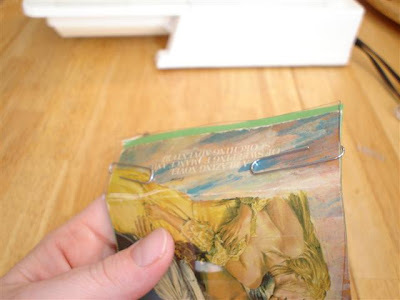 **Just press and work the vinyl (it can be stubborn) and line up the long edges of the cover and interior, and make sure the pockets will fold and lie fairly flat when you close the wallet. **Using your pen or pencil, lightly press/mark the spot for the snaps on each pocket. It will be in the center of each pocket... 1/2" from the cut edge, and 2" from either side as in the picture above. 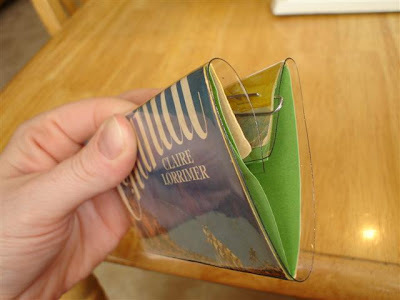 **UNFOLD the wallet, but keep the clips in place, and lay the wallet flat. Don't shift the papers and vinyl around, or it won't fold back up like you had it. **Place your snaps on your pen/pencil marks according to the instructions that came with them. The business ends of the snaps will be facing up, towards the cover side, not facing the interior side. I hope that makes sense. 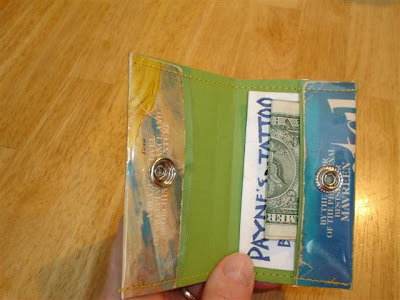 **I don't have a photo of this step, and apparently I forgot to do it on this wallet, but trim the excess overhang of vinyl and cardstock interior to be even with the cover on the pocket ends. 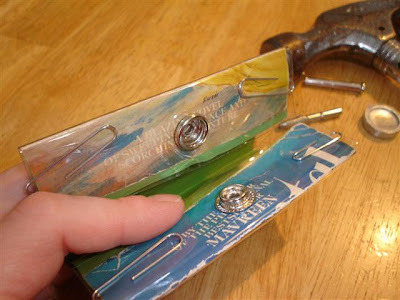 **Refold the wallet, and replace the clips on each end, but this time, clip the pocket to the rest of the wallet, like it will look when it's sewn. 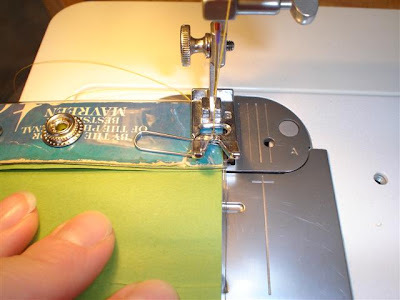 **Sew along the long edge of the wallet, very close to the edge (about 1/8".) Be sure to remove clips as you come to them! **Repeat for the other edge. **Tie off thread on each end. 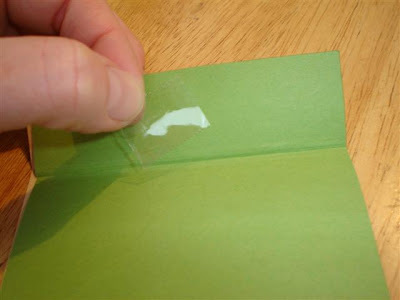 **Trim any excess vinyl or paper along the sewn edges now. **If you're blessed with a rolling foot or teflon foot, definitely break it out for this project. 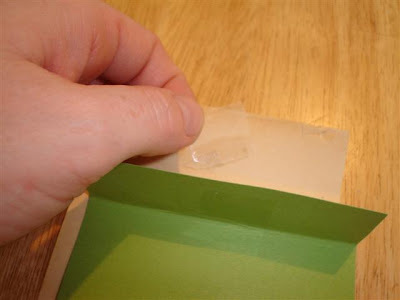 **Otherwise, use a scrap piece of tissue paper (or the paper that the vinyl is usually wrapped in)... about 1" wide and 8" long... and place it along the long edge before you sew, and hold it in place with those paperclips. **Sew through all layers -- even the tissue paper -- as described in the previous step. **When you are finished, just tear off the tissue paper. It will come off clean and very easily! **When fitting the cover to the interior cardstock, it's much easier to make folding adjustments to the cardstock interior than to refold the cover, and it's much less noticeable! **I love the heavy-duty snaps (and they don't tear the paper, miraculously, because of the extra packing tape reinforcements!!) I have also used smaller and decorative snaps, and they work fine, too... they're just a bit harder to set, and mess up a lot more often during placement. 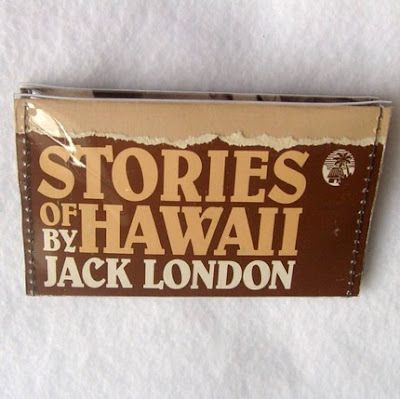 **Old book covers and papers get brittle and soft with age. BEFORE you fold them (as they will just break into pieces) cover the entire backside with packing tape. The paper may still crack when you fold it, but it won't show or fall apart. I apologize if some of my directions are weirdly worded. Please feel free to ask more questions if you need to! We read most of them! We had lots of coverless books in our home library. Some we shared and passed along to others who don't mind coverless books. We also used them in collage / ephemera projects, and making tiny envelopes for my Etsy shop. The ones we didn't use were recycled. The only complaint I have is that my credit cards/debit card do not fit inside the wallet. I want to use it for that purpose and can't. 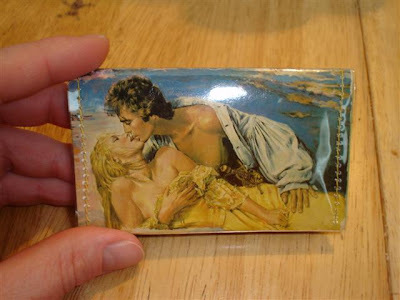 I do like my wallet, but I only can use it for my business cards. I just wish they were a little bigger across (to accommodate a credit card) and a little bigger pockets (meaning that they could hold more cards, etc.) 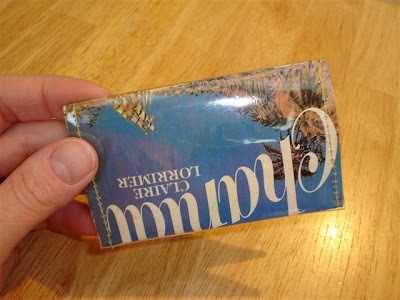 The thinner pocket means that only a few cards can be held on each side. Why not cut it to the size you want? I'm sorry to be the first...I do love it. It's just smaller than I wish it were...not meaning to hurt your feelings. How do you feel about that custom request I posted about? I still have the two card wallets we traded for over a year ago . . . one is in my purse EVERY DAY and is still in perfect condition! :D Thanks for the tutorial, I've never worked with vinyl, looks fun! Just to let you know, I nominated you for the creative blogger award on my site. You don't have to play along, just thought that I wold let you know! I'm also putting up a link to this tutorial on Thursday - I love it! Hi. Louise and Ginger sent me your way! I love the wallets your making...in fact all you things! Great blog, too! I didn't have any suitable paperbacks on hand, so I improvised. I wonder-bonded some fabric onto cardstock and made myself one today. It looks pretty good to me, even if I did let the vinyl get away from me a bit at the folds. I put a picture on my blog! I'm sorry that your sweet little Owen is feeling bad. I hope that both of you are getting some rest! I'm glad that #7 is over the croup. It's tough when the kids are sick...and the sickness often seems to just be making its way through the kids. When you think you've got one baby well, another one gets sick! It will get better, though! Thanks for the tute. I have plans to use some vinyl for another project in the future and I'll have to grab some old paperbacks to use the rest of it! Love this! I'm going to have to try and find some time to make these soon. So clever! Just found this tutorial but unfortunately it didn't work for me. What type of needle did you use for this? I couldn't get it to sew through all those layers. I'm new to sewing so I assume my needle is probably not strong enough. Hi, Jessica! I'm sorry the tutorial didn't work for you. I used a needle suitable for medium-weight fabrics to make these. A light duty needle tends to break, and a heavy duty needle leaves large unsightly holes in the vinyl. Good luck! I have a question ... do you sell these? If so, what is the copyright law regarding using something that is someone else's artwork. I really fuss over stuff like that, so ... but I love this idea!!! I'm a bit late to the party, but what a great tutorial- I've always wanted to learn how to make one of my own. Have pinned and bookmarked this post! Thanks for the tips! Hi, I am a little late too, but I was wondering if you are making these for people because if so I would be interested in having you make one for me but with my kids picture on it. I think I'd put the layers together first, add the snaps (that would take some figuring) then cut the layers all at once. Maybe get them close on the size then trim it up. I'll think about it some more. The reason I trimmed first, then placed the snaps, is that the layers tend to be shifty. The trimmed pieces are easy to handle. And yes -- you can make them any size. 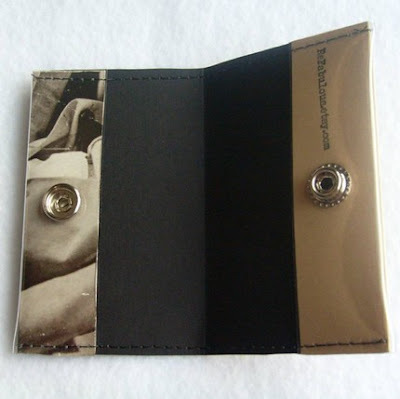 I chose this size because it fits most paperback book covers, the finished size easily accommodates ID cards and business cards, and fits easily in your pocket. But any size media you have is perfectly doable! Hope that helps! Thanks for dropping by, and let me know if you have any further questions or suggestions! "Connie Crawley / refabulous is a participant in the Amazon Services LLC Associates Program, an affiliate advertising program designed to provide a means for sites to earn advertising fees by advertising and linking to Amazon.com." You are reading content originally written by Connie Crawley / refabulous, posted on Hello, Refabulous! If you've enjoyed this blog, please be sure to follow Connie / refabulous on Facebook, Twitter, Pinterest, and Instagram. See you there!